CORFU, THE IDEAL DESTINATION FOR INCENTIVES, CONFERENCES, CONGRESSES, MEETINGS, BUSINESS TRAVEL, INTERNATIONAL CULTURAL AND SPORT EVENTS. Visit the old town that reveal its thrilling history of the powerful conquerors and stroll though the old venetian buildings to find the old and new Castle of the town, the palace of Saints Michael and George, the imposing churches, the square of Spianada, Mon Repo, all revealing the glorious past of the island, that defines its present and destines the island's promising future. The tourist infrastructure of Corfu inside the town and in the coastal villages has evolved to remarkable summer resorts with global fame. The constantly improving high-standard services to visitors, luxurious hotels to serve vocational as well as congresses needs, along with the hospitable locals, make the island a top tourist destination around the world to attract even royalties throughout the centuries. Numerous tourist sites such as Pontikonisi or Achillion, along with the variety of activities offered to satisfy any visitor’s tastes, guarantee a trip to remember. From the city of Athens, Corfu can be reached directly either by plane or by sea, after getting to connected ports. 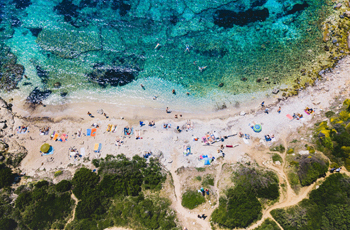 There are daily direct flights from the Athenian airport and some regular flights from other Greek and European cities, while during the peak season of summer, numerous charger flights connect the island with the rest of Europe. Alternatively, Corfu can also be accessed by road to the city of Igoumenintsa situated in Epirus right cross the island or to Patras and then by ferry to its main central port. In case car rental is not an option, KTEL buses make every day routes from Athens, Thessaloniki, Patras and other cities. There is also connection with the Italian ports of Bari, Brintisi, Ancona and Venice, as well as the port of Saranda in Albania. Exploring the Old Town is a stroll through history. A mix of architectural styles is living proof that Corfu has been a prize for conquerors through many centuries; Venetian bell-towers, tiny Greek Orthodox churches, gracious French-style shopping arcades, and British palaces. Unlike the architecture of the rest of the Greek islands, Corfu Town’s shady cobbled squares and narrow alleyways, decked in lines of laundry, would look more at home in Southern Italy. Corfu town, built in the past between the two fortresses, is one of the most charming and romantic places of all the Greece where visitors can enjoy romantic walks especially during the sunset. The red dome of The Church of St. Spyridon stands sentinel over Old Town, whose mysteriously preserved remains and ornate casket are housed in the half-century year old church, and ceremoniously carried through the street on four holy days each year. 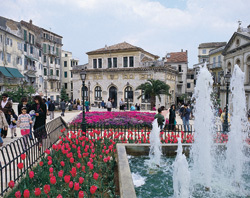 The Esplanade’s Liston Promenade and Spiannada Square is the very heart of Corfu town. Spiannada is one of the largest town squares in Europe, and the leafy Esplanade is filled with historic monuments, a Victorian bandstand, soccer-playing kids, white-clad cricketers, evening brass band concerts and early-morning partiers heading home from popular Liston cafes and bars. Romantic with its small lovely streets between high buildings, its paved squares and its old Venetian walls that in the evening light will impress you with an ancient time fashion. 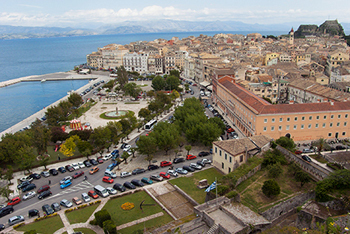 Pontikonisi is the ultimate landmark of Corfu, located in front of Kanoni. The picturesque little island’s lonely Byzantine Monastery that dates back to the 12th century, lies hidden amongst towering trees, just a short boat ride from the scenic convent of Vlacherna, perched precariously at the end of a causeway, and just a head-duck away from the end of the runway at Corfu airport. According to legend, Pontikonis was formed when the ship that delivered Odysseus back to Ithaca, was turned to stone by an angry Poseidon. Paleokastritsa is the most popular spot and one of the picturesque seaside village on Corfu’s west coast, known as “the Capri of Greece.” Nestled in the steep, sloped olive groves, orchards, and pretty purple Judas trees, this famous beach resort is known for its cosy coves, sandy beaches, rocky shores, and gorgeous grottos, best explored by boat, or with mask and snorkel. Legend and locals say it is off the coast of Paleokastritsa where Homer’s Nausica discovered the naked, shipwrecked Odysseus. Climb the high hill to the Byzantine Monastery of the Virgin Mary for leap-into-me sea views, and follow the raucous call of peacocks putting on a colourful show of their own. Lovers’ Lookout or Kaiser’s Throne is a popular lookout, perched high in the peaceful mountain village of Pelekas, eight kilometers west of Corfu Town, as an ideally romantic sunset spot. The natural environment of Corfu island is really stunning and you will not be disappointed by the quality of the several beaches. 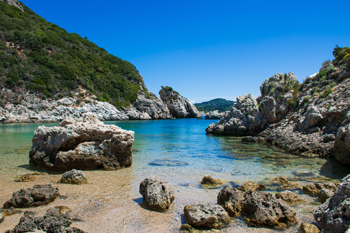 Corfu’s coastline is a paradise for all those who love sandy beaches, but you can also find marvellous rocky bays ideal for snorkeling. Corfu offers at the same time beaches well equipped for tourists offering a plethora of sea related activities such as diving centres, water sports and several kind of safe entertainments and lonely bays where you can relax even in high season. Best Beaches are found in Northern Corfu, with sea temperatures reaching at tropical 27 C in the heat of the summer. Glyfada’s honey-coloured sands and Blue Flag rating keeps it high on Greece’s top beach list. Families like the sheltered, shallow, sapphire waters of Agios Gordios and Sidari. Legend has it that couples swimming through Canal d’Amour in the famous coves just west of Sidari, will stay together forever. The whole old town of Corfu is a sight itself, but the Old Fortress is one of the island’s landmark with amazing views from its towering headland, back over the town, and along the island’s east coast. 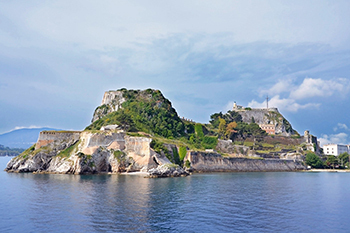 Built initially during Byzantine times, Corfu’s entire population once lived within the walls of the Old Fortress, which is now a museum that features sound-and-light shows telling the fortress’s history. Achillion Palace is widely known as the summer residence of Austrian Empress, Princess Sissy to help her overcome health problems. The palace named after the weak-healed hero Achilles, whose stone statue looms in the lush gardens of this royal retreat, following to the princess’s love for the Greek mythology history and civilization to the extent of herself actually becoming an excellent speaker of the language. The palace hosted most of the royals of that period and it is highly connected to Sissy’s tragic life when married to a notoriously unfaithful husband, having a meddlesome mother-in-law, her son’s suicide, and despite here severe health problems her final assassination in 1898. 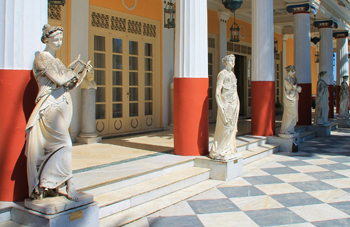 The palace still hosts many personal objects of the royal family, while the building and the gardens are ravishingly decorated with exceptional statues and frescoes. A building of a marvelous architecture that was used in the past firstly by English and then by the Greek Royal Family, today hosts the Museum of Asiatic Arts, the Historical Archive and the Classic Relics Authority of Corfu. Other than strolling around the picturesque cities and villages of the island, touring in order to explore its sights and monuments or just enjoying its wonderful beaches, Corfu has a lot to offer in terms of sports activities options to satisfy the adventurous, athletic and nature lovers. With numerous lovely and fully equipped beaches, the sea lovers can have a diving experience into the Ionian Sea, by using several diving centres all around the island in order to discover its marvellous seabed in areas where the sea is extremely clean and the fauna is very rich and under water rocks are worth exploring. Sailing opportunities around the island are numerous, either by hiring a private sailing boat where you can reach stunning desert beaches accessible only by sea and practise this sport in this relatively windy island being ideal for beginners, or by following organized tours around the island. On the beaches of the most touristic destinations like Sidari, Ipsos, Roda, Kavos etc, there is always a chance for practicing any king of water sport, from jet skiing, Ringos, water skiing and windsurf to use pedaloes and kayaks to discover the coast of Corfu. Bicycle is a good and widely spread alternative to the car on Corfu especially for visitors who wish to discover itineraries hinterland areas of the island, paths and lovely places that are difficult to reach with a big vehicle and untouched by the touristic development, with bicycle rental shops widely spread around the island. Horse riding centres also offer all the necessary amenities as well as qualified instructors for the trained and amateurs to enjoy excursions through lonely places surrounded only by the Mediterranean nature. Trekking in Corfu is a pleasure for any action and nature lover to discover old traditional villages, hidden lakes and mountain paths. Through the signposted footpaths that connect hinterland villages, give one’s the opportunity to admire beautiful landscapes, mountains, forests and coast areas surrounded by olive trees. 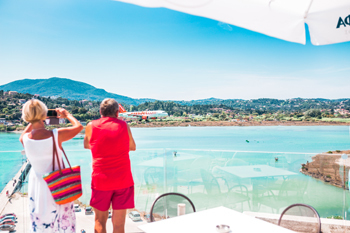 For those who wish to enjoy their hotel facilities along with their favourite sport, tennis and golf can be exercised as there are several sports centres and clubs around the island. The adventurous ones can take parachute lessons at schools located on the west coast of the island to offer possibilities for any level of experience. At a 400 metres altitude the unforgettable view overlooking the whole island under the supervision of professional instructors, is a breathtaking experience. Last but not least, less expected Cricket can also be practiced in the island of Corfu. After a cricket match that took place in 1823 between English Army and the Royal Navy which made the locals passionate about, the sport has become one of the island’s sports traditions. With several local teams and organization of tournaments and festivals attracting some of the best players worldwide and two cricket play grounds, Corfu is ideal destination for the sport’s fans. The Corfu’s cuisine is a blend of Venetian and Greek cuisine and is dominated by local products as meat, fish, olive oil, vegetables and cheese that leaves no visor indifferent in terms of taste and quality. 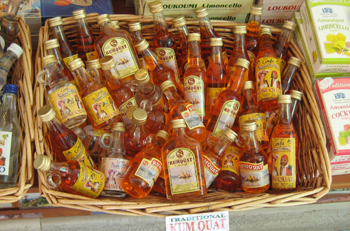 Here there is a great tradition of liqueurs and spoon sweets from a tasty and small citrus-like fruit, Kumquat. Additionally local honey, extra virgin olive oil and sheep yoghurt are locally produced. Finally Ginger Beer, refreshment that was brought by the English is widely produced, along with excellent wine. In Corfu, intellectual gastronomy, traditional cooking and modern touristic appetites, all comprise to excellent gastronomic results to satisfy any palate. The long nutritive tradition of the island, incorporating the modern elements, manages to keep the characteristics of the local cuisine. Today you can find a lot of restaurants following the modern life style with light cuisine, but and every kind of international cuisine (Italian, French, Chinese, Mexican, etc.). Despite all these restaurants you will find more cooking traditional recipes. Bourdeto, sofrito, pastitsada, stifado, strapatsada, tsigareli, the grannies' pastitsio, bakaliaros with agiada, etc. Local deserts also find their place here some of them being mantoles, pastelia and mantolata. 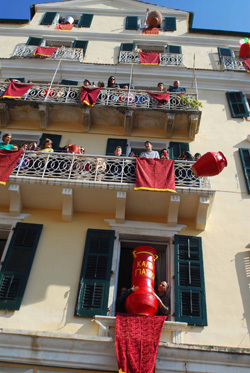 Corfu during the Orthodox Easter is an experience not to be missed. Other than following the typical Greek customs of epitaph (the processions of a representation of dead Jesus) on Good Friday and the resurrection on Saturday at midnight, Corfu offers a unique experience to its visitors. The epitaph in Corfu is special since it is based on a strict protocol as gradually all churches one after the other start their procession passing through the central roads of the old town to finally meet at various points, followed by a choir. 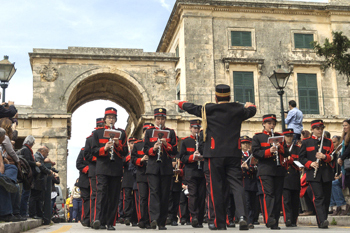 The last procession is the one of the Cathedral church followed by three – out of the numerous – philharmonic bands playing classical music and opera. On Saturday morning during the morning resurrection the locals throw ceramic pots off windows and balconies wishing for the best to come during the following period. At midnight of the same day, all people go by thousands to the central squares of Corfu town and villages, to celebrate Resurrection with glory and typical customs.